KANSAS CITY, Mo. 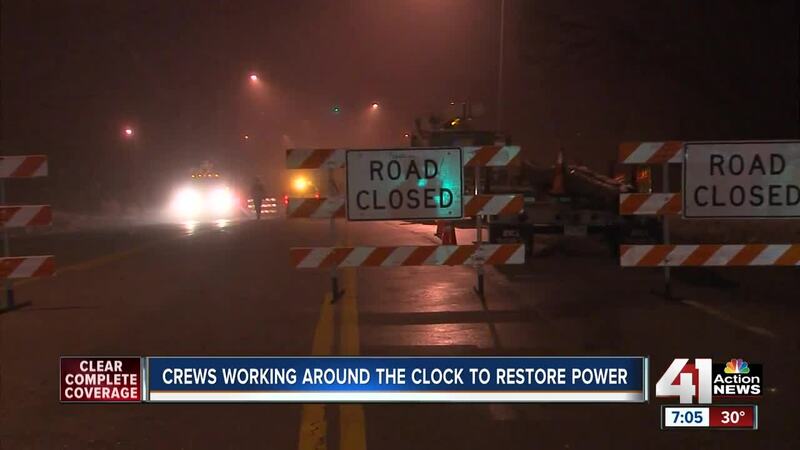 — Kansas City Power and Light crews on Wednesday continued to work on getting power restored for customers going on day five with no electricity. Holmes Road between 108th Street and Red Bridge Road was closed Wednesday morning as KCP&L crews continued to work on outages. On Tuesday, more than 20,000 customers were still without power. By Wednesday morning, that number had decreased to just under 3,000 customers. Other power companies from around the Midwest have assisted KCP&L crews to get the lights back on for customers. Crews plan to have the majority of power restored by Thursday. A winter storm on Saturday dumped more than 11 inches of snow on parts of the Kansas City metro. KCP&L said that Saturday's storm was the third worst storm in the company's history. At the height of the storm, more than 110,000 KCP&L customers were without power.